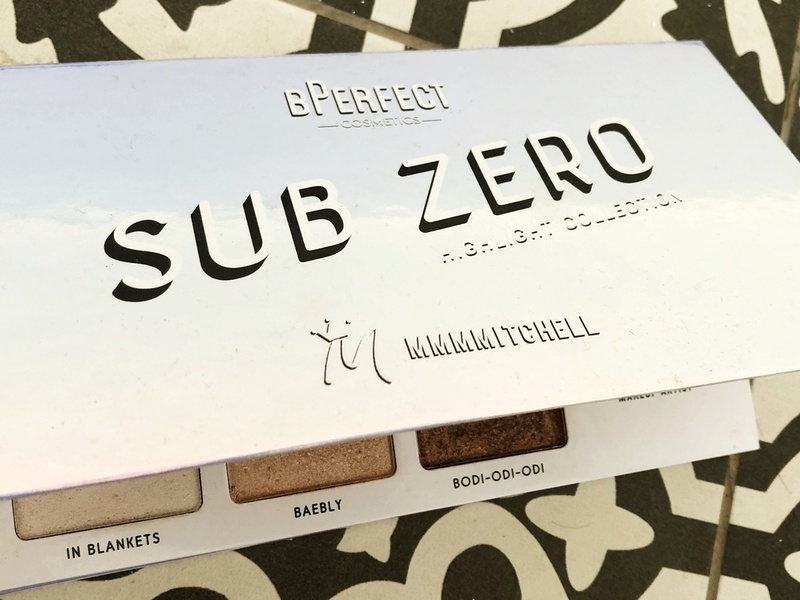 Mancunian make-up mogul Mmmmitchell’s palette Sub-Zero collaboration with bPerfect cosmetics has received rave review in the beauty community so we just had to buy a set for ourselves to see what the fuss was about. Befitting the ‘ice-cold’ name of this palette, the packing takes on a synonymous blue metallic aesthetic to fit the brief. The blue is metallic, with a slight iridescent shine, which we hoped would reflect the shimmer of the highlighter contained within (more on that later). Simplistic white bold lettering spells out the palette name, alongside crediting for both Mmmmitchell and bPerfect with a black drop shadow not dissimilar to WordArt. The font could be more exciting but we weren’t disappointed as the shiny exterior gave enough statement to make up for it. A thick card makes up the outer of this rectangular palette, with a basic lid open and close with no fastening. This is standard design which we expected so meets expectation. It could have featured more premium materials but will still do the job of keeping the contents secured all the same. The addition of a large interior mirror to aid application makes for an added bonus and makes this set better value. It is surprising how many other brands of palette fail to include mirror so the addition on this Mmmmitchell design was a welcome feature. As Mitchell is known for his stunning rainbow eyeshadow designs, we expected a good variety of colour in this highlighter set and were not left disappointed. Sub Zero gives good variety, taking you from the palest white to a dark tan. This accommodates a mixture of skin tones well as you can adapt the range to serve as both highlighter and contour depending on your shade. Each shade has it’s own playful name, including simple titles such as the glistening white ‘Mmmm’ and to the more unique dark bronze ‘Bodi-odi-odi’. Other shades included are sparkly blush ‘Babely’, a golden glow ‘Lifestyle’, a mid-hued ‘OTT’ and paler choices ‘In Blankets’ and ‘Made It’. There is a sparkly texture to each shade which makes for perfect party make-up. Depending how heavy you go and how extra you want your look to be you can achieve more subtle definition or full on unicorn shimmer. The pigment in each colour really is fantastic, making it all the easier for beauty novices to even achieve a lit highlighted look. 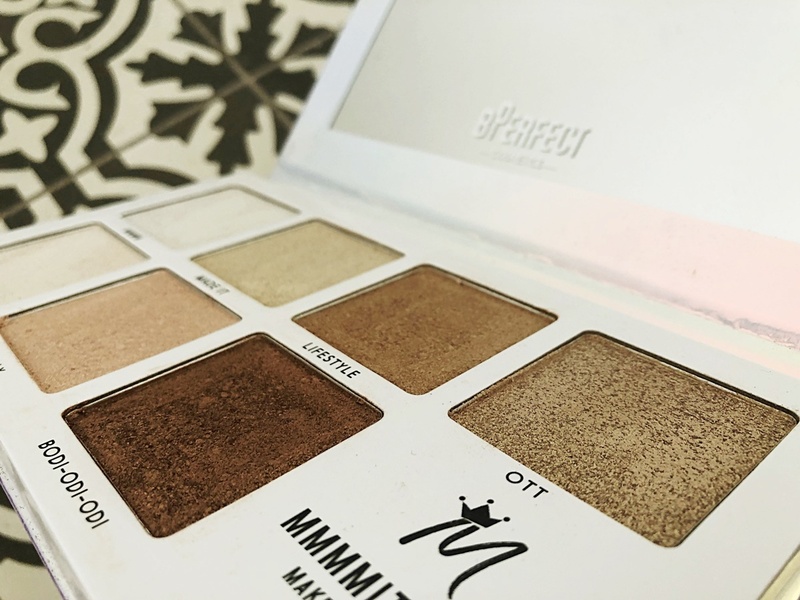 We find ‘Made It’ serves well as a light catching highlighter, whilst ‘Lifestyle’ and ‘OTT’ worked well for bringing added definition as a mid-layer. Girly shade ‘Babely’ was a favourite when going for a more youthful combination. 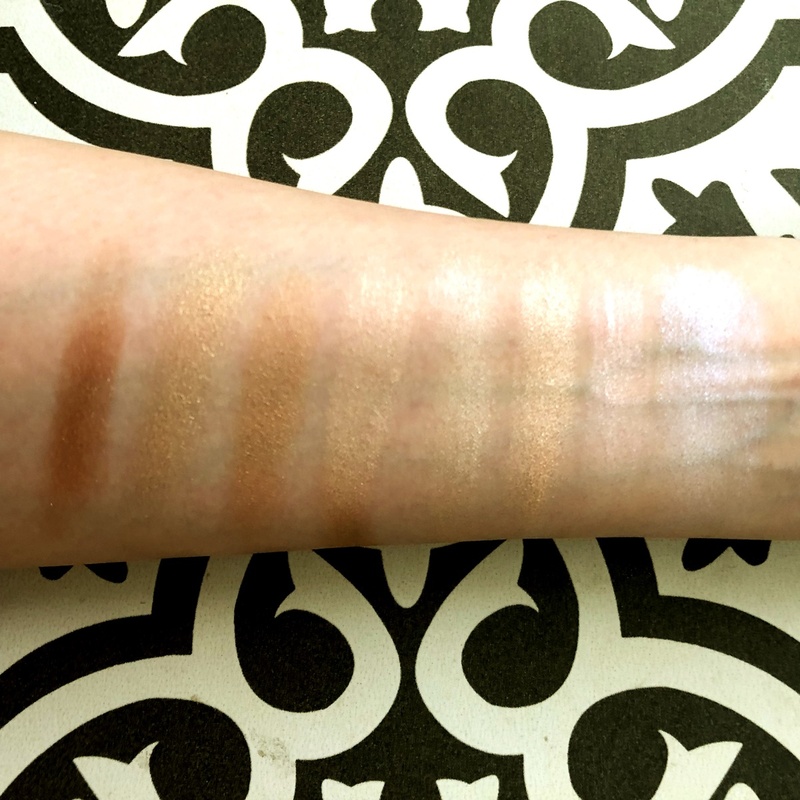 Swatching each colour was like a beauty lovers dream, the shine hits the light beautifully and you have no worry of having to pummel loads on to try and get a mere glisten, the formula is so good it only takes a little to get your desired glow. 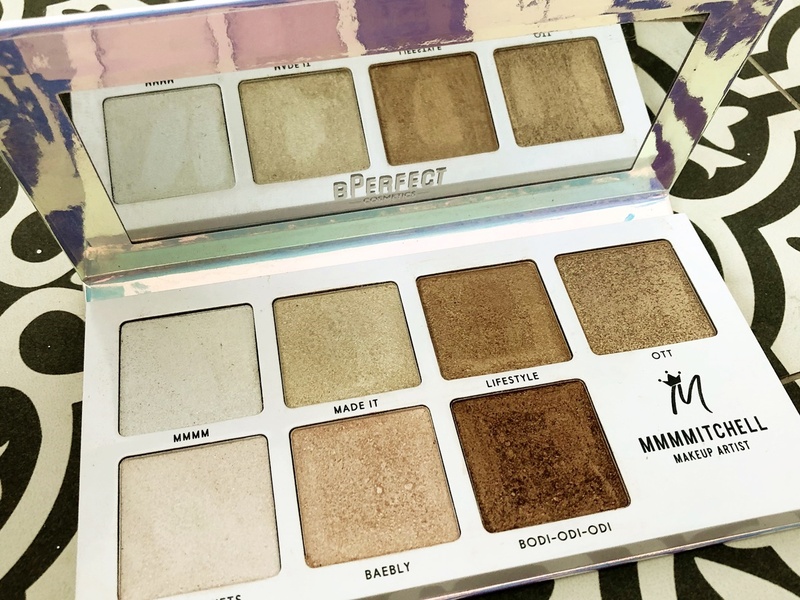 The price point of £33 is at the mid-level, but considering you get 7 shades including, of which offer a mixture of shades, we’d say it’s definitely worth the spend. The quality speaks for itself and this is certainly a palette we found ourselves reaching for again and again. The thick formula allows good last, meaning the £33 serves as a worthy investment. 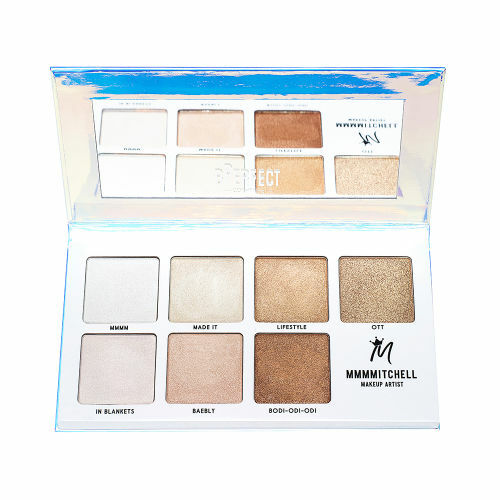 We couldn’t recommend the palette enough if you love a glittery highlight and we look forward to seeing what Mitchell does next. "Comptoir Libanais launches Veganuary Menu"